Musician and songwriter Donald Fagen presents a group of vivid set pieces in his entertaining debut as an author, from portraits of the cultural figures and currents that shaped him as a youth to an account of his college days and of life on the road. 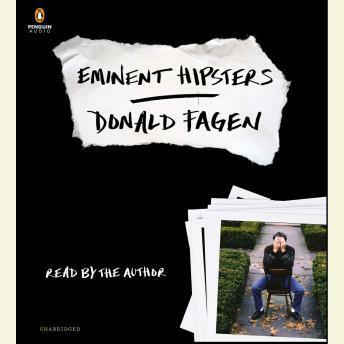 Fagen begins by introducing the “eminent hipsters” that spoke to him as he was growing up in a bland New Jersey suburb in the early 1960s, among them Jean Shepherd, whose manic nightly broadcasts out of WOR-Radio “enthralled a generation of alienated young people”; Henry Mancini, whose swank, noirish soundtracks left their mark on him; and Mort Fega, the laid-back, knowledgeable all-night jazz man at WEVD who was like “the cool uncle you always wished you had.” He writes of how, coming of age during the paranoid Cold War era, one of his primary doors of escape became reading science fiction, and of his invigorating trips into New York City to hear jazz. “Class of ’69” recounts Fagen’s colorful, mind-expanding years at Bard College, the progressive school north of New York City, where he first met his future musical partner Walter Becker. “With the Dukes of September” offers a cranky, hilarious account of the ups and downs of a recent cross-country tour Fagen made with Boz Scaggs and Michael McDonald, performing a program of old R&B and soul tunes as well as some of their own hits. Acclaimed for the elaborate arrangements and jazz harmonies of his songs, Fagen proves himself a sophisticated writer with a very distinctive voice in this engaging book. One of the most depressing books I've ever read. Donald Fagen basically hates most people, especially people from a different generation and even dispises his fans who are getting old. (Oh yes, he's the same age) Celebrities always forget it's the pathetic fans who for their sorry ungrateful lives.